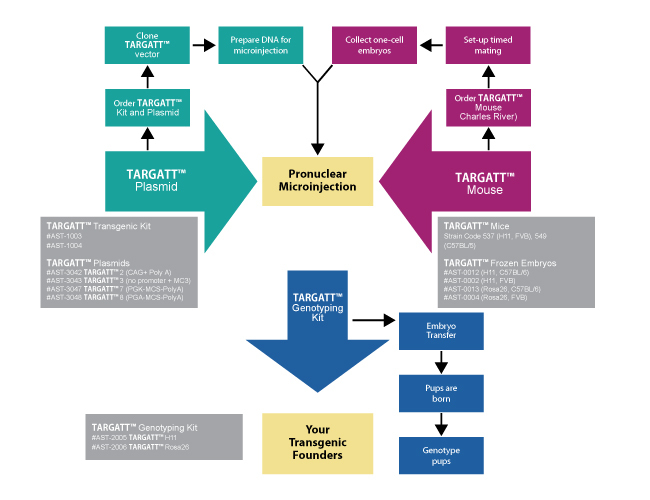 Our proprietary site-specific DNA integration system, TARGATT™ lets you create site-specific transgenic mice in a more efficient and faster way compared to traditional methods. Generating a transgenic mouse (e.g. knock-in mouse) by conventional methods like pronuclear microinjection or lentiviral injection has several limitations, one of them being random insertion of the transgene. Random insertion of a transgene results in position effect where either the transgene is prone to silencing of endogenous gene expression is disrupted. Furthermore, random transgene insertion in the transgenic mouse usually happens in multiple copies, resulting in repeat induced silencing and genomic instability. The TARGATT™ technology uses PhiC31 integrase to insert any gene of interest into a specific docking-site that was pre-engineered into an intergenic and transcriptionally active genomic locus. 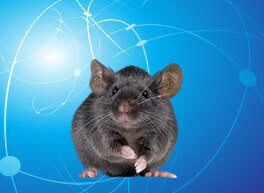 Applied StemCell can create site-specific knock-in mice for you in as little as 3 months. Using our novel TARGATT™ system, a gene of interest can be inserted at a well-characterized, transcriptionally-active locus in the mouse genome with stable and high level transgene expression. Our scientists at Applied StemCell can create a TARGATT™ mouse for you, or you can purchase the animals and reagents to make your own. The TARGATT™ products for mouse model generation are manufactured in our ISO:9001 certified facility in the USA under strict quality controlled protocols and regulations. High integration efficiency mediated by PhiC31 integrase reduces time and cost. Site-specific integration at a pre-selected genomic locus eliminates position effect and ensures high expression levels of the transgene. Integration at intergenic region ensures that no internal genes are interrupted. Single copy gene integration eliminates repeat-induced gene silencing and genomic instability. Site-specific integration allows a precise comparison of the effects of the transgenes among different lines. Ask us for a list of core facilities currently using the TARGATT™ system, including UCSF, NIH, MaxPlank, Harvard, Colombia and many more!